“Okay,” I said, nodding. Just then the Eyrie cab started to lift off. Thunder squealed and Pecan made an odd noise that I suspected to be a laugh. I lifted Thunder out of the crate and cradled him in my arms until he quieted. I stroked his soft fur as the cab rocketed into the air... and promptly collided with another cab. “Sorry, folks!” said our Eyrie shrilly, swerving to the right and nearly dumping us upside-down. “This is my first ride!” he added proudly as the cab swerved again. I gritted my teeth and squeezed Thunder, who yelped and dove back into the crate, shaking. Pecan rolled his eyes and yawned, licking the last crumbs from the Noil Treat away from his mouth. I glanced out the window and raised my eyebrows in shock. We were flying over a large body of water, not the pretty rainbow path that bridged Neopia Central to Roo Island. The Eyrie driver began to dive-right towards the water. Stay here. Yeah, right. I grabbed the crate and clutched it tight against my chest before stepping outside. We were on one of those glass-bottomed boats that run across Kiko Lake every hour. Oh! So we were on Kiko Lake! We must have run off course when our cab collided with the other one. There were only four Neopets on the boat, shocked at the sudden collision but thankfully not hurt. One of them, a scared-looking blue Jetsam, shrieked and dove into the lake the moment I stepped out of the cab. The other three, a family of Acaras, leaned away from me and stared as if I were some kind of monster. I turned my head to see Clark conversing angrily with our cab driver. The boat driver, a smooth-looking disco Kiko, put his hands on his hips (do Kikos have hips?) and went over to talk to Clark and the driver. “Sorry about this,” I apologized to the three Acaras. “This is our driver’s first ride.” They just stared at me. I rolled my eyes and sat down. Clark and the two drivers didn’t look like they were going anywhere soon, so I decided to study the small family. 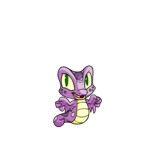 The first Neopet looked to be the only adult and most likely the mother of the family. She was a dark smoky color with jet black ears and stomach. Her eyes were a deep midnight blue and her nose was a bright bubblegum pink. She was clutching a small female Acara with sky-blue fur and pretty lilac colored eyes. Her nose was a lighter pink than her mother’s, and she had a dark purple bib around her neck. The third and last Acara looked to be about my age. She was huddled close to the shadow Acara, so I guessed that she was her daughter. Her ears, nose, and paws were the same pink as the baby’s nose, but her fur was shaggy grey. I expected her eyes to be bloodshot and red like most grey Acaras, but to my surprise her eyes were pure white with dark blue irises, the same shade as her mother’s. There was a scratching noise from inside the crate. I popped open the top and Pecan hopped out, followed closely by Thunder. The baby gave a squeal of delight and lunged for Thunder. “No, Star!” said the shadow Acara sternly, grabbing the baby’s paws and pulling them away from Thunder. Thunder cocked his head and Pecan began sniffing at the Acaras’ feet. The grey Acara reached out toward Pecan. “Can I pet him?” she asked timidly. The shadow Acara stiffened, but I nodded. The grey Acara smiled and began cuddling Pecan. He looked extremely miffed at first, but after a while cooled down and allowed her to pet him. “I’m Bluecloud,” said the Acara, pointing to her blue eyes and cloud-grey fur. “This is Star, my baby sister. We named her that because of the star on her forehead.” Bluecloud pointed to a pale blue star on Star’s forehead, a much lighter blue than the rest of her body, which explained why I had missed it before. “I dot dis fwum Neopia Centwal,” said Star happily, holding up a Roast Gargapple Coin and showing it to me. I noticed that in her lap sat a small blue felt pouch. I pointed to it. “What’s in there?” I asked. “Those are the souvenirs she got from each world,” Bluecloud explained. “You can see them if you want.” I nodded and emptied the contents of the pouch into my paw. Inside I found two pumpkin cookies wrapped in tin foil, an Illusens Comb, a Darigan Carmariller Paddleball, and an Orange and Lime Rock Stick. I smiled and handed the pouch, along with its contents, back to Star. “Emma!” shouted Clark. I whipped around, startling Pecan. He jumped off my lap and growled. Bluecloud quickly recoiled and leaned back toward her mother. “What?” I asked, slightly annoyed. Oh, well. At least they had finally resolved their argument. “What do you,” Clark corrected, but Marty wasn’t listening. “You’re welcome,” said Paul, embarrassed. “Are there any ships that depart from Kiko Lake?” Clark asked, turning to Marty. “I guess we’ll have to swim, then,” said Clark, rolling his eyes. “You can, actually,” said Marty. “Okay, we’ll swim to Brightvale, then,” I said, daring Clark to contradict me. He didn’t. “Well,” I said, glancing nervously at Clark, “you can come with us.” To my extreme relief, Clark nodded. After a moment’s thought, Midnight nodded too.